Never fades, each boy’s or girl’s name is permanently on these blankets. A lucky elephant blanket will thrill your little one! Make every day a magic experience with this ultra comfortable fleece blanket trimmed in silky, soft satin trim. Direct from our Vermont, USA workshop to your baby or young child, we customize each blanket with their name to remind them they are loved. Pink or blue color can suit all youngsters. They will be with friends when they jump in bed, pull up the sheets, put their small head on the pillow under the glow of a nightlight (favorite stuffed animal held tight), knowing they will be sleeping under the watchful eye of their happy protector. An excellent shower gift personalized with the name of the upcoming infant or, for a recently born baby, add a birth date to make a custom keepsake that can be used as the perfect photo prop for memorable photos. A stroller drape, car seat blanket, carrier cover, security blanket or 1,000 other great uses. Stimulate Your Baby’s Sensory Responses! Silky soft fleece texture attracts your baby’s touch with a beautiful elephant design to engage their eyes! Impress Any Child with a Great Gift ! For babies to toddlers and even the older boy or girl who loves elephants. This plush blanket makes a wonderful first birthday gift … sure to please everyone! 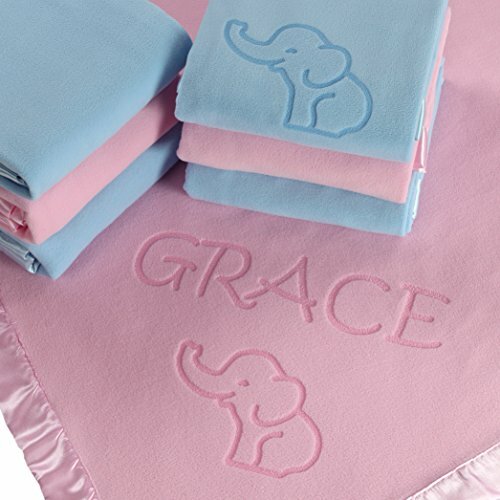 Your little tike is one-of-a-kind, just like this personalized elephant blanket. Treat your precious one to a special blanket customized just for them. Your toddler will carry a trusty companion everywhere as they explore. Ideal size for little hands to carry. LARGE 36 x 36 INCH SIZE – The ideal stuff for infant strollers, bedding, newborn celebration!